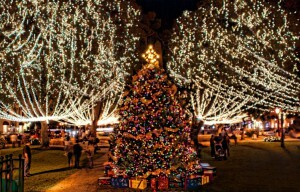 Northeast Florida is known for its spectacular holiday lights, but none shine brighter than historic St. Augustine’s Nights of Lights celebration. In fact, Rachael Ray magazine named St. Augustine one of the Nation’s “Twinkliest Towns” in 2014. 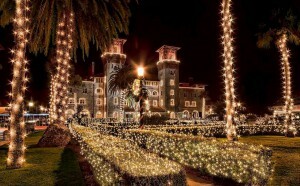 National Geographic also dubbed St. Augustine one of the Top 10 Places in the World to view holiday lights in 2012 and 2013. This year’s event looks to be just as “twinklie” as previous years with more than 3 million lights going up through the town. The celebration will run from November 19 through January 31, 2017. Plenty of events will accompany the splendor throughout the season! Here are just some in November and December. When: Saturday, November 19, Countdown to lighting at 6:30 p.m.
Information: Come early for live music before the big countdown! When: Saturday, December 3, 8:55 a.m.
Information: The one-mile run traces the St. Augustine Christmas Parade route just before the parade begins. $10 entry fee. For information, call 904-669-0107. When: Saturday, December 3, 9 a.m.
Where: Starting near the Mission of Nombre de Dios (101 San Marco Avenue) and ending at the Visitors Center on Castillo Drive. Information: Arrive early! The parade starts promptly at 9 a.m. When: Saturday, December 3, 2 p.m. and 7 p.m.
Information: The family-friendly production follows a young girl’s journey home for the holidays. Ticket prices $15-$20 in advance online and $20-$25 at the door depending on seat location. When: Wednesday, December 7, 7-9 p.m.
Information: Enjoy a free evening of children’s holiday crafts, warm refreshments and live music. When: Saturday, December 10, 8 a.m.
Information: The race follows a flat 3.1-mile course through St. Augustine Beach neighborhoods. Registration is $30 before race day and $35 on race day. Proceeds benefits St. Augustine Youth Services! When: Saturday, December 10, 6 p.m.
Information: This spectacular parade of decorated boats is held every year just north of the Bridge of Lions. When: December 17-18 (Saturday and Sunday), 1:30 p.m. and 7 p.m.
Information: Admission is $25-$30. For ticket information, call 855-222-2849. When: Saturday, December 31, 4-10 p.m.
Information: This annual event features a kid zone, food vendors and live entertainment. Don’t miss the fireworks at 8:30 p.m. 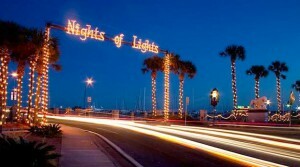 There are lots of other events throughout St. Augustine during the Nights of Lights celebration! Check out http://www.floridashistoriccoast.com/ for more information. Easter brunch specials are springing up all around town! Feel the Wheels encourages kids to explore fire trucks, racecars and more! 24th Annual Rhythm & Ribs Festival coming to St. Augustine this weekend!